Limoges is a city in France. It is most know for producing porcelain like this. In the late 1700’s raw materials to make porcelain were discovered in the area. A local statesman with a sharp business sense, Anne Robert Jacques Turgot, spearheaded the production. Turgot helped establish a viable economy in what was then an economically distressed area. He started out as a tax-collector in Limoges gathering from some of the poorest and most over-taxed people. In this post, he became a Robinhood city official, of sorts. He rose on the ranks. He did so well that at the peak of his power he was the minister of the Navy and held the purse strings of the country as Contrôleur Général des Finances. He attempted to hold everyone in government, king included, to a high moral standard. He was fairly successful in his pursuits but eventually feel out of favour and lost it all. 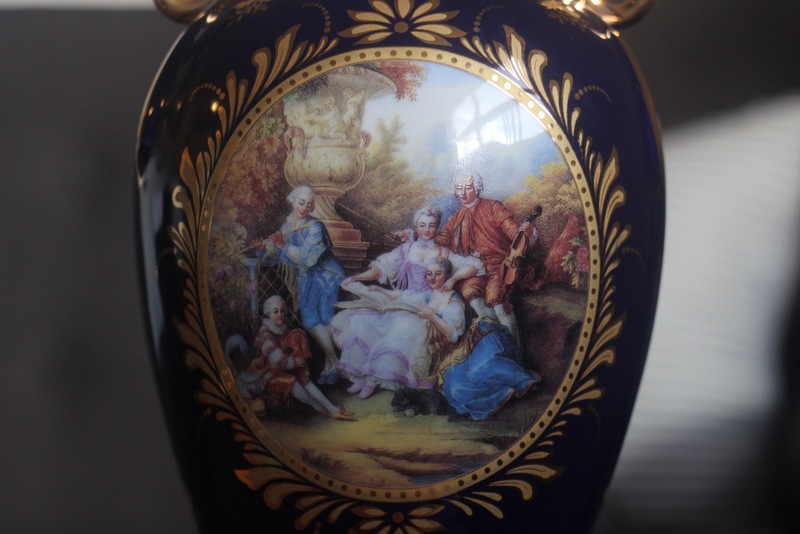 The divide between rich and poor was so great at the time, and if the art on this vase is any indication, the wealthy rich at the top didn’t want to let it go, so he had to. He may have been a sacrificial lamb for the cause, but a handful of years after his fall, the French Revolution broke out.